My dream of one day flying first class has been upgraded to a dream of one day flying first class in one of Emirates’ new suites. Yeah, you heard me: suites. 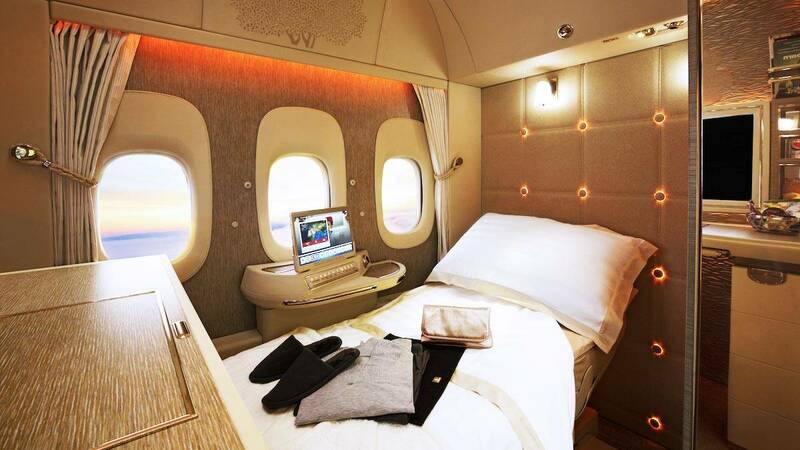 The new Boeing 777 and Airbus A380 fleet has literal rooms for individual flyers who are willing to drop tens of thousands on a plane ticket, and tbh I’m wondering how long I’d need to work for to cover it? Each little room has floor to ceiling walls to give the passenger complete privacy, meaning smelly people and screaming kids are not a worry. Just imagine. Editor of The Points Guy Zach Honig tried the new suite for himself before sharing a video, and people literally cannot handle the palatial planes. Who needs actual windows when you can just get the outside world virtually projected onto the wall? And those little plane screens will not be necessary if you have an individual 32-inch TV. As for food, no doubt it makes a foil tray look shameful. Aside from the inevitable cost—which hasn’t yet been revealed but is sure to be eye-watering—there are a couple of issues with the suites. It’s only currently available on two of Emirates’ routes out of Dubai: to and from Brussels and Geneva. Also, you can’t even fly economy and go sneak a look, since the airline "is currently blocking all but the most expensive fare class on flights with the new suite." Still, it’s important to have dreams.